1 Arlington is located on the SW corner of Arlington and Beacon, with 100 Beacon to the northwest, across Beacon, 2 Arlington to the south, and 101 Beacon to the west. 1 Arlington was designed by architects Gridley J. F. Bryant and Arthur Gilman, and built ca. 1860 by J. E. & N. Brown, carpenters, one of three contiguous houses (1-2-3 Arlington) built for clothing manufacturer and real estate investor John L. Simmons. The land on which 1-2-3 Arlington were built was originally part of a larger tract purchased from the Commonwealth of Massachusetts on August 1, 1857, by William Warren Goddard and T. Bigelow Lawrence. They sold a corner lot (40 feet on Beacon by 112 feet on Arlington) to John C. Gray on September 1, 1859, and a second lot of the same size, immediately to the west, to John Simmons on October 1, 1859. John Simmons purchased John Gray’s lot on November 1, 1859, and purchased an additional strip of land five feet by 112 feet from Goddard and Lawrence on April 30, 1860, completing a lot which was 112 feet on Arlington and 85 feet on Beacon on which he had 1-2-3 Arlington built. Click here for an index to the deeds for 1 Arlington. In his Houses of Boston’s Back Bay, Bainbridge Bunting indicates that 1-2-3 Arlington “probably” were designed by Gridley Bryant and built ca. 1861. Roger Reed, in his Building Victorian Boston: The Architecture of Gridley J. F. Bryant states that they definitely were designed by Bryant in association with Arthur Gilman, and cites a May 25, 1860, Boston Transcript article as his source (that article discusses a number of houses and states that thirteen of them were designed by Bryant and Gilman; 1-2-3 Arlington appear to be among them). 1-2-3 Arlington were designed to give the appearance of one large, monumental building, in the French Academic style popular in Paris during the 1850s and 1860s. 2 Arlington – the middle house – is set slightly further back from the street than the two surrounding houses, whose mansard roofs project outwards slightly to frame it. 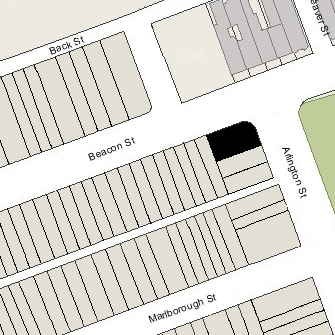 As originally designed, there was a five foot wide passageway at the rear of 2 and 3 Arlington, running parallel to Arlington and underneath the rear ells, to provide access to the alley for all three houses. On June 22, 1863, William Fletcher Weld and his wife Isabella Melissa (Walker) Weld purchased 1 Arlington from John Simmons. William Weld was a shipping merchant whose firm, William F. Weld & Co., was at one time the largest ship owner in America, sailing under the “Black Horse” flag. He also was a major investor in railroads and real estate. The Welds lived at 1 Arlington until his death in December of 1881. Their unmarried son, George Walker Weld, lived with them. They also maintained a home in Newport. 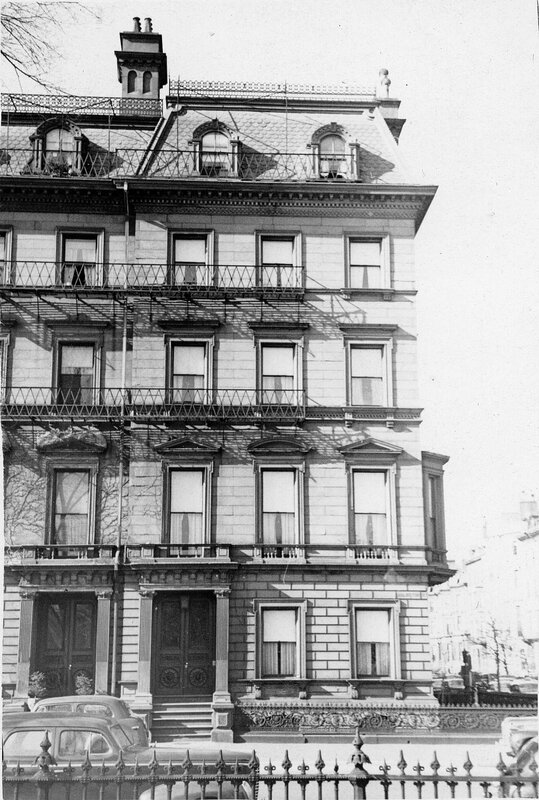 After William F. Weld’s death, Isabella and George Weld moved to 115 Commonwealth. On October 9, 1882, 1 Arlington was purchased from William F. Weld’s estate by Leonard Richardson Cutter and his wife Mercy Fairbank (Taylor) Cutter. They previously had lived at 27 Hancock. Leonard Cutter was a builder and real estate investor, and served at various times as Assessor, Alderman, Member of the Boston Water Board, and Water Commissioner. He also served as interim Mayor of Boston in 1873. The Cutters continued to live at 1 Arlington until their deaths in 1894: Mercy Cutter in January of 1894 and Leonard Cutter in July of 1894. By the 1894-1895 winter season, 1 Arlington was the home of Leonard and Mercy Cutter’s son-in-law, Horace W. Baxter, Jr. He was the widower of Emma A. Cutter, who died in November of 1894. They had lived with his parents in Brighton before her death. Horace Baxter was a real estate investor and trustee. He and his sister-in-law, Agnes Elizabeth (Cutter) Bigelow, the wife of Dr. Enos Hoyt Bigelow, served as trustees of the Cutter estate, which continued to own 1 Arlington. In September of 1905 he married again, to Sarah E. Jenks, and they moved soon thereafter to 524 Commonwealth. 1 Arlington was not listed in the 1907-1909 Blue Books. 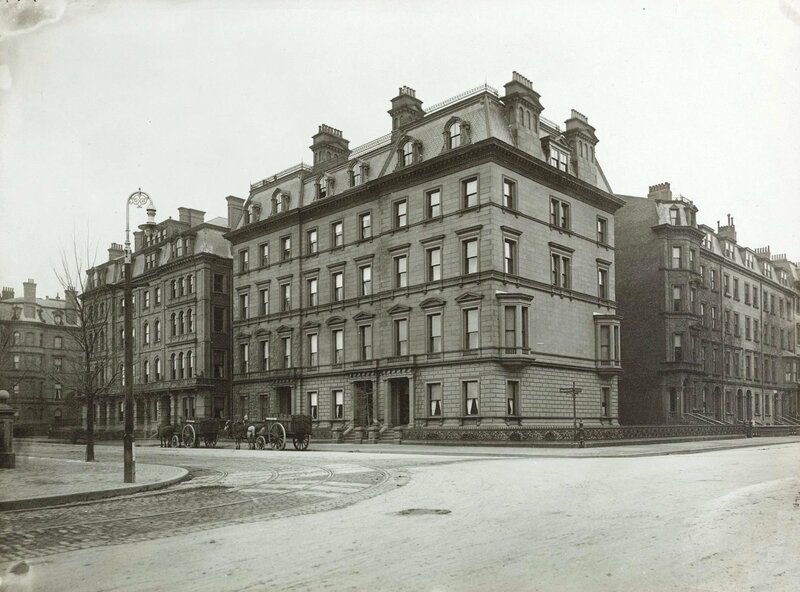 By 1910, 1 Arlington was the home of Mrs. Celia E. Murray, who operated it as a lodging house. 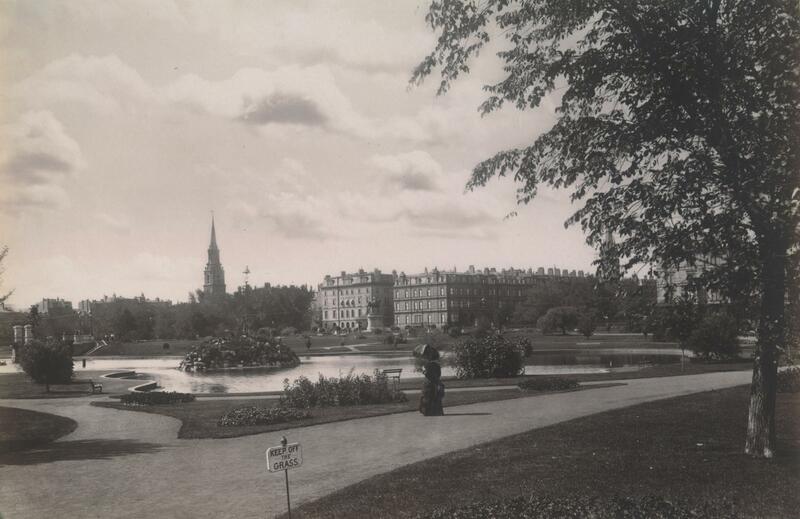 She continued to live there until about 1917, when she moved to 14 Newbury. By the 1917-1918 winter season, 1 Arlington was the home of William A. McCarthy, a frame gilder, and his wife, Mary J. (Barrett) McCarthy, who operated it as a lodging house. They previously had lived at 376 Newbury. They continued to live at 1 Arlington in 1920, but had moved to 31 Newbury by 1921. On August 12, 1920, 1 Arlington was acquired from the Cutter estate by attorney John D. Graham. On the same day, he transferred the property to the Roman Catholic Archbishop of Boston. 1 Arlington became the diocesan center of the League of Catholic Women of Boston. An August 14, 1920, Boston Globe article noted that it would be the first “permanent headquarters” of the organization. The League continued to maintain its offices there until about 1968. 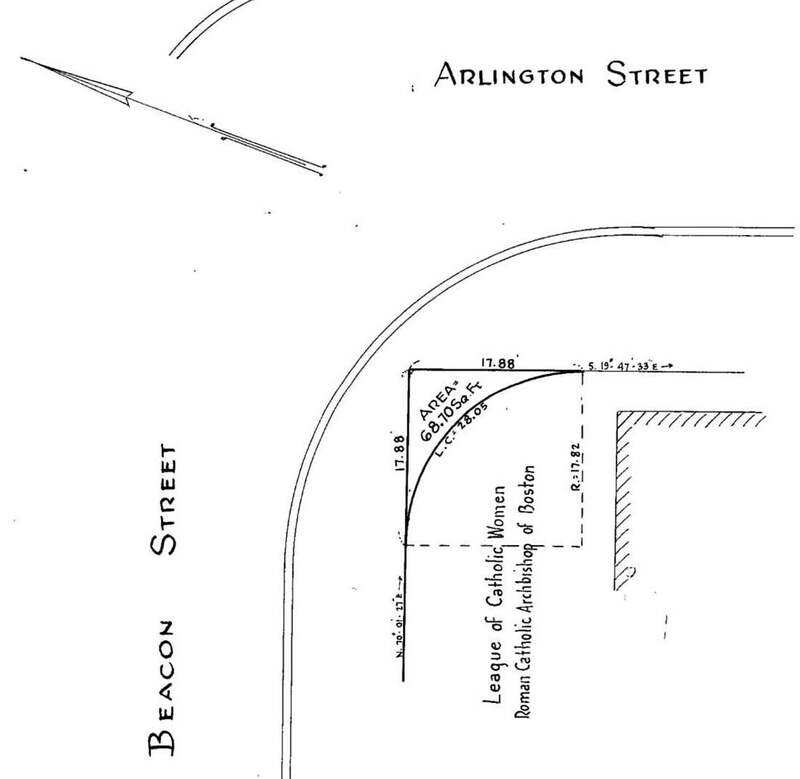 In September of 1951, the Commonwealth of Massachusetts Metropolitan District Commission modified the intersection at Arlington and Beacon, creating a curve at the southwest corner that reduced the lot at 1 Arlington by approximately 69 feet. On August 28, 1968, 1 Arlington was acquired from the Roman Catholic Archbishop of Boston by the One Arlington Associates LP, a partnership of Daniel J. Finn, Joseph M. Krol, William E. Sayers, and Francis B. Sellew. 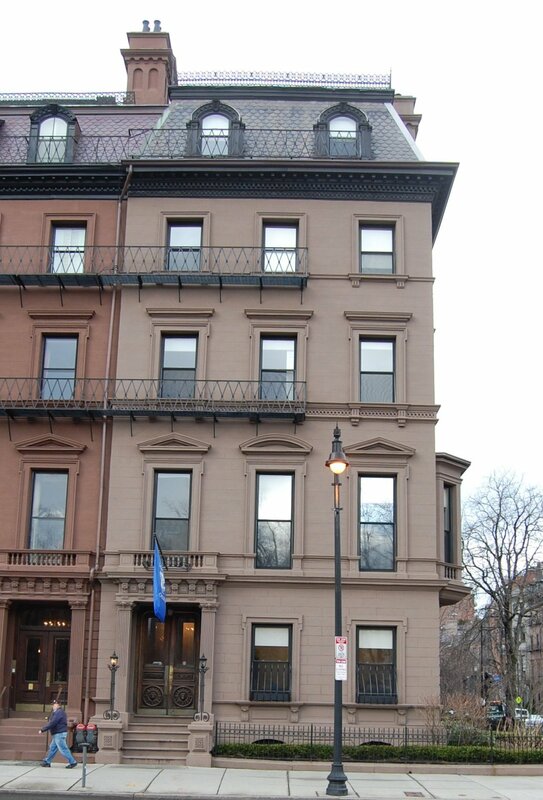 In December of 1968, the One Fifty Four Beacon Street Associates LP (another partnership of the same co-venturers) filed for (and subsequently received) permission to convert the property from a club (the League of Catholic Women) into ten apartments. On August 1, 1969, 1 Arlington was acquired from the One Arlington Street Associates LP by the Unitrust Corporation. On February 18, 1976, the South Boston Savings Bank foreclosed their mortgage to the Unitrust Corporation and sold 1 Arlington to Joseph Jokton DeMarco. He and his wife, Ute D. (Brammer) DeMarco, lived in Newton. Joseph and Ute DeMarco owned and operated the Boston School of Modern Languages, located at 795 Boylston, and moved the school to 1 Arlington after purchasing the building. It remained there until the late 1980s, when it moved to Roslindale. Emerson College subsequently occupied the building for office space. Joseph Jokton DeMarco died in November of 1994 and 1 Arlington was inherited by Ute DeMarco. She continued as president of the Boston School of Modern Languages. In October of 1998, she married again, to Count Jochen von Haller. On May 2, 2006, 1 Arlington was acquired from Ute DeMarco von Haller by Fisher College, which converted into it offices for its admissions department, bursar, and other college functions. Fisher College also owned and maintained classrooms, various school facilities, and dormitories at 102-104–106–108–110–112–114–116–118 Beacon, 111 Beacon, 115 Beacon, 131–133 Beacon, and 139–141 Beacon. In February of 2013, it acquired 10-11 Arlington.